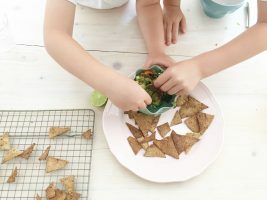 Homemade tortilla chips with guacamole is a recipe I make all the time with my boys. It keeps them busy for a good half hour and the end result is a really healthy, delicious snack or becomes part of their dinner. My two are almost 6 and 7 and they can make this on their own with some guidance. Try not to interfere beyond setting everything up, talking them through the steps and the knife bits. Don’t attempt this when you’re on the clock or you’ll end up getting stressed and they won’t get into it. I find it easier to sit them at the kitchen table and lay out all the kit and ingredients along with the recipe. 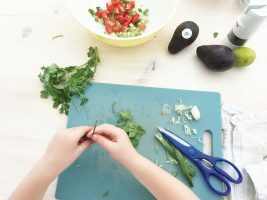 Encourage children to taste as they go and help them learn what happens when they add seasoning – not just salt but herbs and lime. Get them to think of other things they could serve the chips and guacamole with. 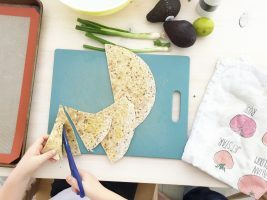 Have them copy out the recipe and start a folder with the recipes you make together. If you’ve only ever thought of tortilla chips as coming out of the bag, you’ll love these. They are baked so they are much lower in fat, salt, sugar and additives than the bought ones. Even if you’re adding salt yourself. So they are a great way to get that chip fix more often. Perfect when you need something crunchy with a glass of wine after the children have gone to bed too! 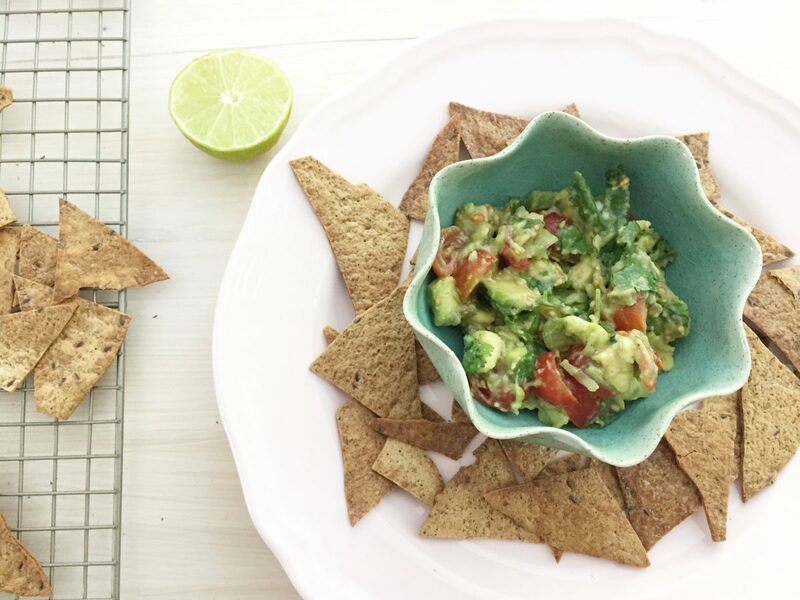 Serve the chips with guacamole, salsa or make nachos by layering them with salsa, guacamole, shredded cooked chicken, or my sweet potato and blackbean chilli, and a little cheese and then baking them until the cheese melts. I make a big batch of the chilli every month and keep small bags of it in the freezer just for fast dinners like this. Just microwave it and serve it as nachos or with a baked potato and chopped up raw veg. I love these round ended serrated knives (click on the picture to find it on amazon) when I cook with small children. 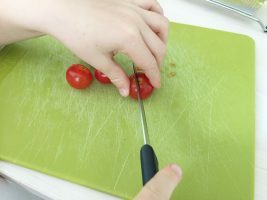 Getting them used to using a knife safely is so important. Scissors are also a great way to help children chop things. To be safe, they should hold what they’re cutting with their thumb and forefinger, like a bridge, and use the knife in between (we say the knife is a train the fingers are a tunnel). And remember to only use a knife when a grown up is around, and only hold the handle and not touch the blade. Always supervise children around knives and the oven. I usually make chips from 2 wholemeal tortillas (wraps) at once as that is what fits on my tray, but you can make more on multiple trays. I like the flax and seed wraps from Lidl or Waitrose. Most of the supermarkets will have something similar in the fresh bread area. In the US you can pick them up at Trader Joe’s. I keep wraps in the freezer and just grab one out when I need one. They defrost really quickly and are also a great alternative to a pizza base if you need a pizza fix. Preheat the oven to 200°C (180°C fan) or 400°F (350°C convection). 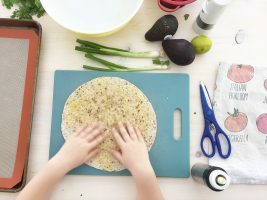 Brush or use fingers to cover both sides of the tortillas with about a teaspoon of olive or rapeseed oil. 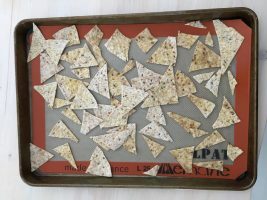 Cut the tortilla into chips with cookie cutters or scissors. 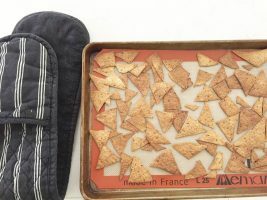 Spread the chips in a single layer on a large baking sheet and sprinkle with a little sea salt or some smoked paprika. 5. Bake until golden brown and crisp for 12 to 15 minutes. 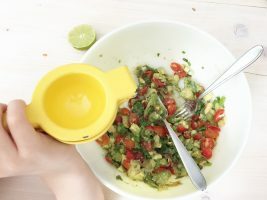 Note – Guacamole will go brown if it is left for long so eat it within an hour. It still tastes fine if it is a bit brown but just doesn’t look as good. 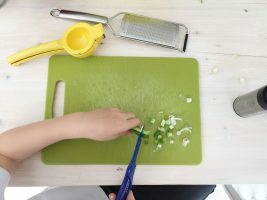 Using scissors or a knife, chop the root off the onions then slice them thinly across by holding both onions next to each other and cutting through both together in 1cm slices. Add the slices to the bowl. Chop the tomatoes in quarters (see note about using the knife safely) and add them to the bowl. Chop the red pepper. Cut off the top in one slice then use your knife to cut around the core, throw away the core and seeds then slice the flesh into thin slices. Set half aside then hold the other slices together and chop into a small dice. Add to the bowl. Pull the leaves off the herb stems and rip the leaves into small pieces. Add to the bowl. Get an adult to slice the avocados in half then twist to remove the stone. For reassurance you could hold the avocado in a tea towel to give you a little more protection from the knife. Get an adult to cut slices through the avocado flesh, not all the way through to the skin but almost there, then scoop the slices out with a spoon into a medium sized bowl. Zest the lime into the bowl using a fine Microplane zester then slice the lime in half and juice it into the bowl. Add salt and chilli flakes or pepper. Stir together then taste and add more seasoning and lime juice as needed. Eat with chips, raw carrot, cucumber and pepper sticks and pride! 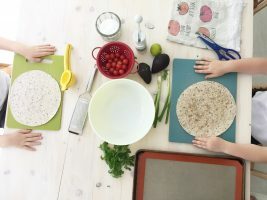 Find more recipes for tortillas, avocado and children’s meals here. I’d love you to share pictures of your little ones making this. Please add them on my Facebook, Instagram, Twitter or Pinterest when you make it. Tag it #ystcook so I can see!